Welcome to this campsite in Morbihan! Land and sea come together to make sure your stay at the Yelloh! Village Belle Plage is a truly unforgettable one. This really pleasant, family-friendly campsite, with direct access to the beach, will be the perfect place for discovering the region's highlights. Relaxation, walks along the coast, discovering Brittany's culture, boat trips to the islands and more! There's so much to choose from! There's no doubt about it: you really are in one of the finest open-air hotels! 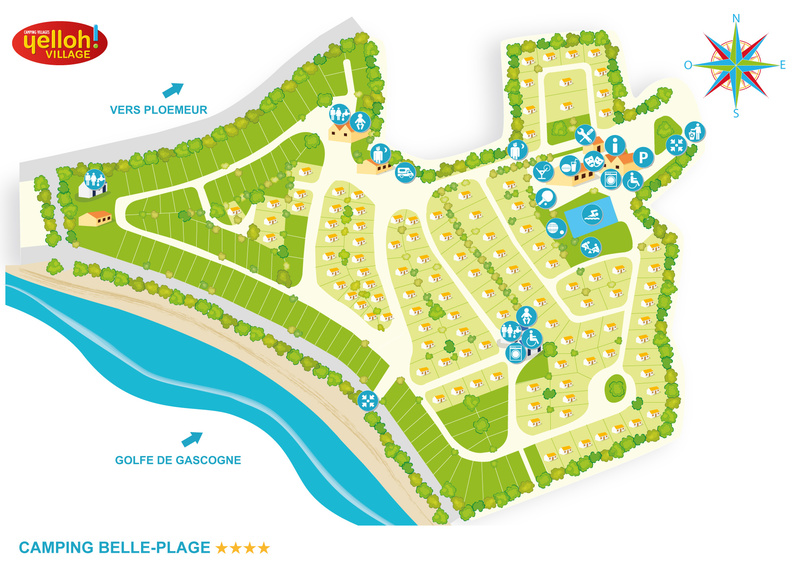 The camping Belle Plage has a wide range of accommodation options with all the mod cons, as well as a covered and heated swimming pool for enjoying a stay that's not at all run-of-the-mill! A wellness area with body treatments and facials, massages, reflexology etc. There are just so many things to discover in Brittany: you'll have so much to choose from during your camping holiday in Ploemeur! This region will be the perfect place for walks with the family, and the Morbihan coast can be explored on foot, by bike, and even by sea kayak! People who enjoy the sea and boats in general will be in seventh heaven: they'll love the Musée de la Marine in Port Louis, the Cité de la Voile Eric Tabarly, visits to a military submarine in Lorient and the authentic little fishing harbours. Set off for a day's adventure visiting the islands, which you can see from the beach! The wild and captivating Iles des Glénans are sure to be a hit! From the camping Belle Plage, you'll have ringside seats for discovering the rich and fascinating Breton culture. Come and have a look around the village of Poul-Fetan, where Breton life is re-enacted, or come and enjoy Lorient's interceltic festival, which is Europe's biggest Celtic-themed event! Watersports activities will also feature high on the menu during your camping holiday in Ploemeur: with sea kayaks, sailing, surfing and more, why not choose a bit of ocean-flavoured excitement on holiday!